Yesterday in class my lecture was about qualitative data collecting in cultural anthropology, I spoke about the pluses and minuses of surveys. One problem in standard questionnaires can be that participants misunderstand your terminology. For example, if you are doing research on the 'homeless,' everyone must be in agreement as to what it means to be homeless. I then asked my class, "What does it mean to you to be homeless? What kind of picture comes to mind?" Like every other semester, these college freshman said, "Someone living on the street," "Someone who doesn't have anything," or "Someone who has to go to a shelter." They never really bring up families or employed people in their scenarios. They also think of homeless people as dirty and disheveled. I then talk about a family I once knew, an employed mother of three whose son participated in sports with my son. They lived during the week in hotels, and not always the same one. On weekends the children often stayed with relatives in a nearby city. In the summer they stayed with relatives who lived out-of-state. The children never missed school. They went to play dates and parties at the homes of their classmates, played sports, joined after school activities in art and dance, and on some days spent afternoons at the library. We live in suburban Connecticut and these children knew the city bus system backwards and forwards. Their mother often shopped at Goodwill stores for their clothing. "Would this family be considered homeless? "I asked my class. "Do you think the family sees themselves as homeless?" I'm not sure myself, and I never asked. While indeed this family may have been 'situationally homeless" by some definitions, the mother worked very hard to keep the children in their routine of school, play and family. Fortunately, this episode in the lives of this family passed. The mother obtained a good job, they moved to another city and the children thrived. Always outgoing socially and excellent students, the older two are now in college. While this scenario may sound like an anomaly, sadly it is not. 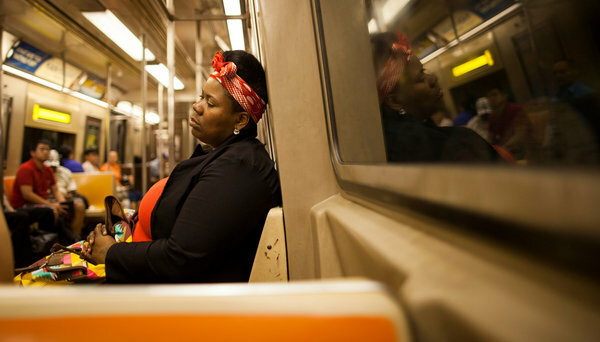 Today, in a New York Times article by Mireya Navarro, "In New York, Having a Job, or 2, Doesn’t Mean Having a Home,"
we learn that more and more single people and families, even though they are employed, cannot move from shelters to their own homes. Barriers include low wages, poor credit records, high rents and a lack of low income housing units. People living in shelters and maintaining respectable jobs juggle dual identities everyday. Perhaps it is not a coincidence that the same edition of the New York Times shows that "Household Incomes Remain Flat Despite Improving Economy." Or, in a related issue, the "Percentage of Americans Lacking Health Coverage Falls Again." The way out of poverty and into the middle class seems to become a steeper mountain to climb even as corporate profits grow and the economy, on paper, improves. Which leaves me where we began - redefining the word "homeless." For the complete article on the working homeless in New York, click here or continue below. On many days, Alpha Manzueta gets off from one job at 7 a.m., only to start her second at noon. In between she goes to a place she’s called home for the last three years — a homeless shelter. With New York City’s homeless population in shelters at a record high of 50,000, a growing number of New Yorkers punch out of work and then sign in to a shelter, city officials and advocates for the homeless say. More than one out of four families in shelters, 28 percent, include at least one employed adult, city figures show, and 16 percent of single adults in shelters hold jobs. Mostly female, they are engaged in a variety of low-wage jobs as security guards, bank tellers, sales clerks, computer instructors, home health aides and office support staff members. At work they present an image of adult responsibility, while in the shelter they must obey curfews and show evidence that they are actively looking for housing and saving part of their paycheck. David Garza, executive director of Henry Street Settlement, which runs three family shelters and one shelter for single women with mental illnesses, said that five years ago his shelters were placing 200 families a year into permanent housing. Last year, he said, they placed 50. “Without low-income housing, it’s a maze with no way out,” Mr. Garza said. The employed homeless are constantly juggling the demands of their two worlds. A 45-year-old woman named Barbara, who works part time as a public transit customer service representative, said she had to keep items like razors and nail clippers at a storage center because they were not allowed in the shelter for security reasons. Sometimes she takes a tote bag filled with dirty clothes to work to take to the laundromat afterward, she said, because the machines at the shelter are always either broken or being used. But, she said, there is no escaping the noise and fitful sleep of a dormitory shared with eight other women. Like most homeless employed people interviewed for this article, Barbara did not want to be identified by her full name for fear of losing her privacy or her job. She has been homeless since 2011, she said, when her unemployment insurance ran out and she could no longer afford her apartment in Brooklyn. No one at work knows, she said. “When it comes to the professional arena, I want people to think that I got it together, that I’m not living paycheck to paycheck, that my only option isn’t to buy secondhand,” she said. Sometimes homeless workers discover one another. Deirdre Cunningham, 21, who works two part-time jobs — as a bank teller and as a sales clerk for an electronics store in Manhattan, said that at one point a co-worker at the store invited her to an evening event. “I said, ‘I can’t go, because I have curfew,’ and this co-worker said, ‘What do you mean curfew?’ ”“I said, ‘I live in a shelter,’ and she said, ‘I do, too.’ ” Ms. Cunningham, who has a 4-year-old daughter, said she has always been open about her struggles. “A lot of people have problems, too,” she said. She said she left her parents’ home in the South Bronx in 2011 because she did not want to expose her daughter to “family issues.” Two years and three shelters later, she moved in August into her own $900-a-month one-bedroom apartment in the Bronx with the help of a rent subsidy from the Coalition for the Homeless. But the aid lasts for only two years. “Now that I got my living situation under control, now it’s time for me to go back to school, get a better job, be more of a mother,” said Ms. Cunningham, who has completed training as a medical assistant but aspires to be a journalist. “My daughter wants to take ballet,” she said. A city-commissioned study by the Vera Institute of Justice in 2005 found that “contrary to popular belief,” 79 percent of homeless heads of family had recent work histories and more than half had educational levels, up to college, that made them employable. Most, the study found, had experienced “destabilizing” events before entering the shelter, most commonly the loss of a job, an eviction or the loss of public assistance benefits. In 2004, Mayor Michael R. Bloomberg unveiled an ambitious plan to reduce the city’s homeless population — then 38,000 — by two-thirds in five years. The plan envisioned shifting dollars away from the shelter system to create low-income housing with social services. To make the shelter system less inviting, the city also stopped giving homeless families priority for public housing, and made it harder for those who left the system to return. In 2011, when the state and federal support were withdrawn, the city ended a program that gave rent subsidies for up to two years to help families move out of shelters and into their own apartments. Now the number of shelter residents hovers around 50,000, according to the city’s Department of Homeless Services. More than 9,000 are single adults and more than 40,000 other residents are in families, including 21,600 children. The average monthly cost for the government to shelter a family is more than $3,000; the cost for a single person is more than $2,300. Linda I. Gibbs, Mr. Bloomberg’s deputy mayor for health and human services, said there were no local resources to keep up with demand for subsidized housing after both federal and state money dried up. Advocates for the homeless say the city should restore housing assistance for shelter residents, including giving them priority for public housing. But in an interview, Ms. Gibbs reiterated the Bloomberg administration’s long-held position that more benefits only attract more people to shelters. “That drives more demand,” she said. “It’s a Catch-22.” Ms. Gibbs said officials were now exploring expanding a city program that helps families at risk of losing their homes to stay in place.